How lucky I am to be alive this morning, that death did not occur last night. How lucky I am to have my perfect human body; how lucky I am to have met Rinpoche, my most precious guru who reveals to me the un-mistaken path to enlightenment; how lucky I am to have met the Buddhadharma; I should not waste my life. The purpose of my life is to free all sentient beings from suffering and its causes, and to lead them to liberation from samsara and to the state of peerless happiness - full and total enlightenment. This is my responsibility. To do so I must transform my mind, and I myself must actualize the path towards enlightenment. I must accumulate merit and do virtuous actions. I must avoid non virtuous actions so that all my actions become only causes for me to attain enlightenment, so that I can bring other sentient beings to enlightenment  as quickly as possible. may ALL my actions be virtuous actions. May all my actions become cause for happiness and enlightenment. May all my actions bring happiness to all sentient beings. May all my actions bring enlightenment to all sentient beings. May I practice the holy Dharma in accordance with the teachings of the Lam Rim, and in accordance with the advice of my precious holy lama. Guru, founder having destroyed the two obscurations, being qualified by six qualities and having gone beyond samsara, Gone as it is; enemy destroyer, O complete and perfect Buddha, Glorious conqueror Shakyamuni, to You I prostrate and go for refuge, and make offerings. By the power of truth of the 3 jewels, of the blessing of all the Buddhas and Bodhisattvas, of the great might of the completed two collections, and of the pure and inconceivable sphere of existence, may these offerings become such ness. At the level of your forehead, 2 meters in front of you is a large golden throne. It is beautifully adorned with jewels, and supported at each corner by a pair of snow lions  signifying the fearlessness of the Buddhas. On the throne is a lotus, signifying Buddhas holy mind and mind untainted by samsaras shortcomings. On the lotus are two disks  the sun and the moon. The sun signifies wisdom, the moon signifies method. Together they signify the unification of no more learning. Buddha seated on them signifies achievement of this unification. The lotus, sun and moon also signifies the principal aspects of the path to enlightenment. Concentrate on this. On the lotus, sun and moon is Shakyamuni Buddha who has attained perfect realizations. He manifests the omniscient mind of all the Buddhas, the ultimate guru and is therefore inseparable from your lama, your root guru who shows the un mistaken path and is bound by infinite compassion to you and to all sentient beings. Buddhas body, in golden light, is magnificent. He wears the three robes of a monk. His face is beautiful. His eyes see all others and me. His gaze is peaceful. His mind is free of all critical thoughts. He accepts you fully. the Dharma the scriptures, and the Sangha. 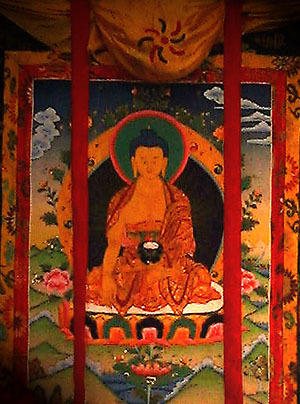 Then Recite 108 times (known as one mala) the Refuge mantra. NAMO GURU - BEH, NAMO BUDDHA - YA, NAMO DHARMA - YA, NAMO SANGHA - YA. Reciting the Refuge prayer pleases Buddha. Nectar flows down from His holy body and enters your body and mind. The nectar cleanses all negativities, obscurations and diseases, and purifies negativities accumulated in your relationship with your Guru. The nectar develops positive realizations and blessings from the guru. The nectar brings you under the guidance of the Guru triple gem. May all sentient beings abide in equanimity, free of anger and attachment . I confess all my negative actions accumulated since beginning less time. After your meditation and prayers, focus your mind on attaining Enlightenment for the sake of all sentient beings. The dedicate the merit gained from these prayers and meditations by reciting thus: By the positive potential thus created may I attain Enlightenment for the sake of all sentient beings. May the Bodhicitta mind in me not yet born, arise and grow. May that born have no decline but increase forever more. You can add further dedications depending on what you wish to pray for. I have found that prayers that are dedicated to others have greater power and merit than prayers devoted to oneself. To the good health and well being of your family, or if you have a guru, it is very full of merit to dedicate your prayers to the long life and continued good health of your guru. The most important dedications are to prayer for Liberation from Samsara and for Enlightenment for the sake of all sentient beings.